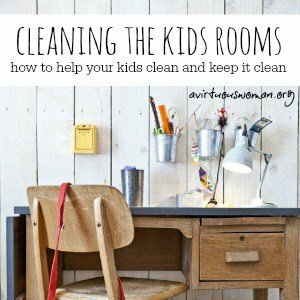 Cleaning the children’s rooms is similar to keeping your own room clean. Follow the same basic steps as listed in the “Caring for the Bedrooms” post. The trick to keep kids rooms neat is really in how to train them. Diligent training will pay off in the end! When your child wakes up in the morning, immediately make the bed. When he or she is old enough to help, have them help you make the bed. And when they are old enough to do it alone, have them make the bed alone (or with a sibling if they share a bed, as is the case in our household). Instilling a love for neatness in your child early on will benefit both of you! From the time your child is old enough to walk, he should be helping to keep his things in order. Schedule regular clean up times each day and help your little one to put his toys away. I suggest that you have clean up times just before lunch, just before supper, and again before bed. The one hold out on this would be if your child is creating a large project – for instance, a grand Lego® castle, or building a tower with his Lincoln Logs®, or painting a masterpiece. In this case, I would tell my child that everything but that one thing has to be put away. When it is time for a bath or time to change into pajamas at the end of the day, train your child to place their discarded clothing in the proper place, whether it be the hamper, a laundry basket, or perhaps they are to hang their clothes in the closet or return to a drawer to wash next time. Show them how to do it immediately rather than later. Training means being involved. Training your children means you are aware of what if going on in their lives on a daily (even hour to hour) basis. You will never train your children properly if you are a distracted mother. Books, TV, the internet, work, hobbies, etc. should never take your attention so much that you fail to instill proper life skills in your children. 1. If the room is really bad, sweep everything into a pile on the floor or have your child pick up everything that is out of place and put it on the bed. It is much easier to sort things from a central location than it is to move from place to place all over the room. away your dirty laundry. Now, I want you to put your shoes in the closet. Clean your mirror. Sweep the floor. Straighten the bookshelf. Children do not instinctively know how to clean up a really messy room. They need your loving guidance. It is also much easier to keep a neat room clean than it is to clean up a messy room. This is why it is better to have regular “tidy up” times throughout the day. That way, things are less likely to get out of control in the kids rooms as well as the rest of the house! God has given us as mothers such an awesome responsibility to train our children to become productive, kind, loving adults. Let’s not squander the opportunity! 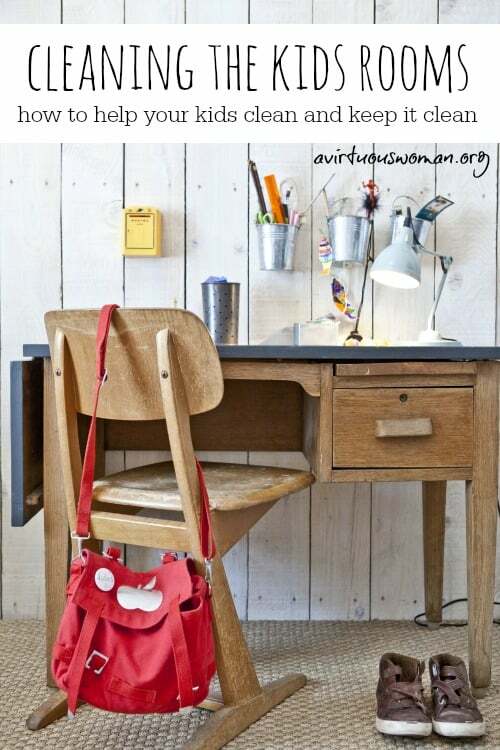 What are your best tips to help your kids keep their room clean? I think you are right - kids don't necessarily know how to clean up. Breaking it into a series of smaller tasks will help it seem achievable! I'm a big believer in having kiddos involved in keeping their rooms clean. Thanks for the tips- they are things I'll keep in mind when we start our family some day! In my home we make every effort to keep the entire house clean. The day that is set aside for cleaning is more for the bathrooms and vacuuming. I have found that putting things in place after use has made cleaning less stressful for everyone. Thanks for the post, you have made some really good suggestions. We tidy twice a day, usually with me standing in the middle of the room giving directions. My girls (2 and 4) always ask me to help, but what I've learnt is that they mean they want guidance and encouragement. The whole task overwhelms them and they don't know how to start,breaking it down makes it much easier. I made my 4 year old a tidying . It says "Tidy" and then a list of things each with a picture; books, clothes, shoes and toys. These are the items that make it onto the floor most regularly in her room. (I think my next version will include colouring things). It has helped her get started on tidying and I can just come and give her some extra encouragement. (And get started on the 2 year old's mess at the same time rather than one after the other. My little one takes Everything out during her 'nap time'. ). I actually think it has helped her think about putting things away as she finishes using them rather than when the pile gets in the way.